Social housing tenants in Waterloo are used to being public housing tenants, and to deal with Housing NSW as their landlord and the body that manages the property they live in. Since the announcement of Waterloo Redevelopment and the tenancy transfers all across NSW from public housing to community housing, there has been more discussion about the differences between these two models of social housing management. First of all, it is important to remind that so far, no decision has been made about who will manage future social housing in Waterloo. The latest government commitment, released in October 2017 in the ‘Vision Consultation – Drivers & Commitments’ document, states that “The model of management for social housing (public/community housing) will be determined through the redevelopment process”. It is likely that at some point during the Waterloo Master Planning process there will be discussions about who should manage the future social housing properties in the area. To help you make up your mind about social housing management, and what might be your preferred options, we briefly present some key points below and list resources you can access. Prefer to have a look at a simple infographic? The ‘Everybody’s Home’ campaign has put together a one page that explains all the different housing terms. Community Housing Organisations (CHO) or Community Housing Providers (CHP) are not-for-profits bodies that build and manage affordable housing. Access to their properties is based on social criteria. They are therefore a social housing management organisation. The agreements in place between a CHP as a landlord and their tenants are similar to those in public housing, and CHPs also offer avenues for tenant participation in community life, just like Housing NSW. Rent is usually set around 25% of tenant income. What is the difference with public housing? CHPs, due to their smaller scale, are usually considered to be more responsive and to provide a more personalised tenancy management. This is reflected in the higher rates of tenants satisfaction in community housing compared to public housing. From a financial point of view, CHPs can usually afford to spend more money in repairs and tenancy management for several reasons; they can access Commonwealth Rent Assistance (CRA) for their low income tenants, a source of money from the federal government, they can benefit from tax concessions such as the GST excemption, and they are able to borrow funds more easily than government bodies to build and deliver more social housing. Although rarely used, CHPs do have the possibility however to end a tenant’s lease without having to go through as many legal processes as the NSW government does for public housing. Why does government wants to expand community housing? The differences mentioned above lead government to believe that a higher proportion of the social housing stock being managed as community housing is a good thing. Government is interested in the management model leading to higher tenant satisfaction rate, as well as reducing its fixed costs by transferring properties to CHPs that can later on access CRA from the federal government. Government also believes that competition between different CHP and differences in management models is beneficial for the tenants and the social housing sector as a whole. 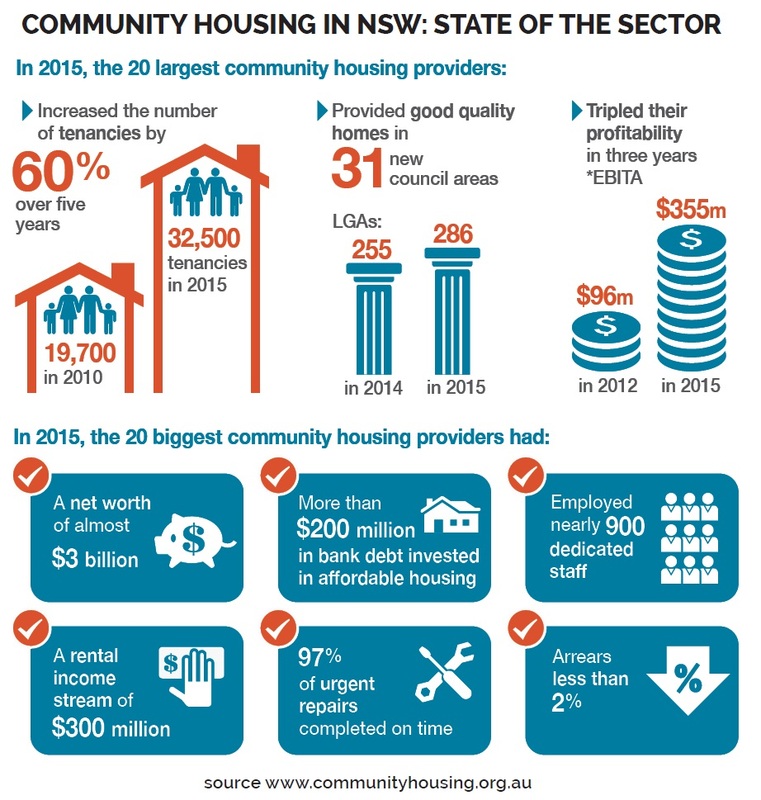 The infographic below gives you an overview of the state of the community housing sector in NSW. Community Housing in NSW is growing, with more and more social housing properties being managed this way. If you would like to read a more in-depth analysis about whether community housing is set to feature in future urban renewal in Waterloo, follow this link to: Hal Pawson’s analysis in the latest edition of Inner Sydney Voice Magazine. If you missed the capacity building workshop about Community Housing and would like to know more about what was discussed on the day, download or have a look online at our debriefing document. We hope that these resources help you understand better the discussions around future management of social housing in the Waterloo area. Do not hesitate to contact the Capacity Building Project Worker if you have any further questions.